Handel and Rameau are both frustrating composers for organists. Both were very keen organists throughout their life, but Rameau left no organ music, and Handel very little. I have given many organ recitals solely devoted to Handel’s music, but only by drawing on music almost certainly intended for harpsichord. It works well, but I would love to have heard Handel (and Rameau) improvising on the organ. This CD is something of a nod towards that very happening. 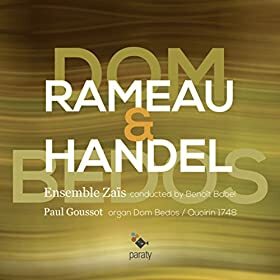 The unspoken premise of this recording seems to be that Handel and Rameau (born two years apart) meet near the west coast of France (which Handel certainly never ventured even close to) in a church housing one of the largest and most comprehensive French baroque organs ever built – the 1750 Dom Bedos organ of Saint-Croix in Bordeaux. There happens to be an orchestra present. They set about a run-through of some of their pieces, Handel expanding on his Organ Concertos and Rameau transcribing some of his orchestral and harpsichord ensemble works for organ and orchestra. Both improvise at will. As long as you accept the premise that Handel would have never heard (or even envisaged) his organ concertos played on an organ like this, then you can just enjoy some extraordinary sounds. The amazing range of colours on the classical French organ is taken to an extreme in the Bordeaux organ. It also includes an incredibly rare, if not unique, example, of a 32’ Bourdon stop on the Grand Orgue manual. Paul Goussot cannot resist the temptation to make full use of the organ, whatever the authentic Handel sounds might have been – and, on the ‘if you got it, flaunt it’ principal, why not? We know that solo keyboard versions of the Handel organ concertos were widely sold – more so, in fact, than any orchestral versions, so the idea of playing them on a large church organ is reasonable. But there is no evidence, despite what the programme notes might say, of them being played in France. Or of Handel improvising in a very grand French style, as happens on several occasions on this CD, including one entire bombastically improvised Overture rather naughtily listed as being by Handel rather than the player. At least the Handel pieces were intended for organ, albeit not one remotely like this. The Rameau transcriptions are more of a problem. Generally composed for harpsichord with accompanying flute, violin and viola da gamba, they hail from completely different sound world than that of a full orchestra and an enormous organ. The transcriptions, although occasionally instrumentally colourful (notably with some jaunty bassoon playing by Marie Hervé), are grossly overdone and rhythmically often rather lumpy. Perhaps the clue to all this lies in the CD liner notes where a whole page is given over, seemingly randomly, to the organ association that promotes the Saint-Croix organ (and others) in Bordeaux. It is a curious choice of music to demonstrate an organ, however grand it might be. So, by all means enjoy this CD for what it is, but please do not think it is anything like the never-to-be-heard experience of hearing Handel or Rameau themselves improvise.